You’re in for a bonanza of a Club GASS night this June! 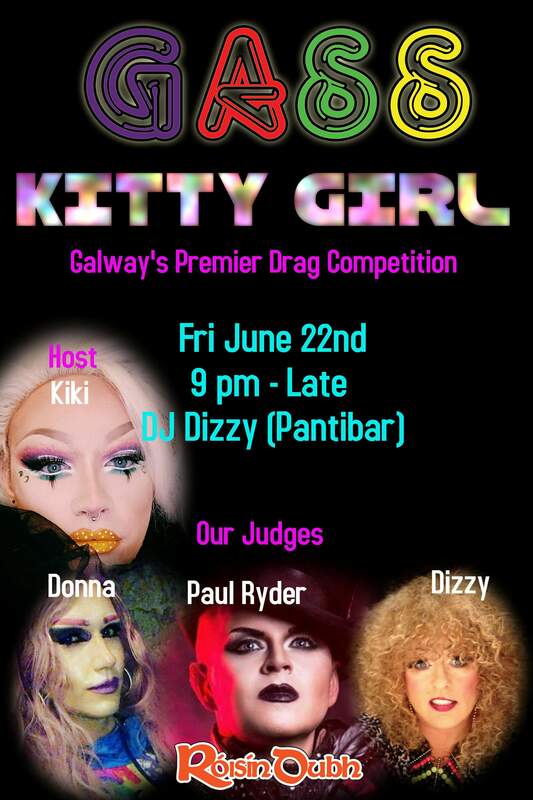 Club GASS are holding a drag competition on Friday June 22nd for GASS Kitty Girl, Galway’s Premier Drag Competition, in the Róisín Dubh, Dominick Street, Galway, from 9pm till Late. Your host for the night is the wonderful Kiki St Clair, and the competition will be judged by the experienced, learned, impartial (really!) judges Donna, Paul Ryder and Dizzy. This exciting event will be followed by the usual great Club GASS club night, and DJ Dizzy will be spinning the discs! This really is a night you don’t want to miss, so get on your glad rags, and see if you can be the next Kitty Girl!